Ernest Broeniman is the band leader of Dorf Kapelle and also solos as “Mr. Brass.” Dorf Kapelle is a well-loved traditional German-style brass band (Blas Kapelle). The band has 17 members with a German-born vocalist. Dorf Kapelle presents many styles of Germanic music. Members dress in traditional outfits and give a description and translation of each piece they perform. “Mr. Brass” is a retired Band Director who presents a delightful music enrichment program that explores 15 common, antique, obsolete and unusual brass instruments. Anytime throughout the year, anywhere in the state. 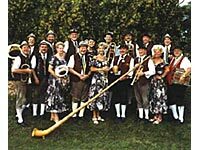 Dorf Kapelle has performed at many festivals throughout Wisconsin. The band was named one of the top five performers at German Fest in Milwaukee, 1999.